Trust your next bathroom remodeling job to the experts at Bradley Construction. We’ve been remodeling bathrooms in the Bethesda, MD area for over 35 years. A typical small bathroom remodeling job includes new flooring and shower tiles, new vanity sink and toilet. 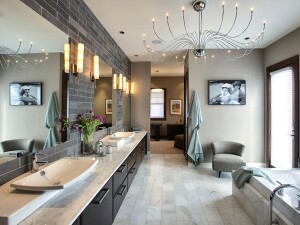 Bradley Construction also has experience with large scale bathroom remodeling. We can add square footage to your current bathroom in addition to moving sinks and toilets. Our design will go over all of the details including tile, vanity and counter top choices. We’re flexible and value oriented. We use the latest in CAD and design software to come up with a rough floor plan & elevation view of your project. A bathroom remodel will increase the value of your home by adding convenient features with a beautiful design. Things to consider: What universal design features would you be willing to include in your remodeling project? Grab bars and barrier-free shower in bathroom-Wider doorways/hallways – Ergonomic door/cabinet handles – Task lighting – Single-level faucetry ? Do you prefer to take showers or baths? If you like baths, would you prefer a tub and shower combination unit or separate facilities? Have you always wanted a claw foot tub or would you rather install a whirlpool? What kind of lighting do you want in your bath? You can still obtain a water rich environment with water-saving features. For some ideas, go to Kohler’s web site to view bathroom sinks, faucets, toilets, etc. You can also go to the National Kitchen and Bath Assn.’s web site as well as our portfolio section for additional information on your project. Contact us today and let us turn your bathroom into an oasis you deserve. CALL BRADLEY CONSTRUCTION TODAY! TAKE ADVANTAGE OF OUR WINTER SAVINGS! Call (301) 253-6087. Bradley Construction – Bathroom remodeling in Bethesda, MD since 1978.